PKG (pronounced package) specializes in contemporary, personal gear for the digital age. 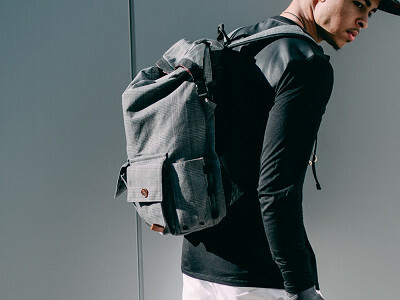 Their rolltop backpacks for device-toting urban warriors are designed with a clean, modern aesthetic and constructed with lightweight, high-tech materials that are breathable and waterproof. With thoughtful features like an external laptop compartment, closures with buckles, padded shoulder straps, and microfiber screen cleaning cloth, this versatile piece will be your go-to bag for all occasions. Based in Ontario Canada, PKG was founded by brothers Andy and Mike Priestman after their search for functional and handsome carriers. They were inspired by their own business-travel needs, which extended beyond traditional gym bags and briefcases to include storing and protecting their electronics. More grown-up than ubiquitous school backpacks, these are sophisticated enough to bring to work or weekend getaways. Lightweight, waterproof and breathable laptop bags. Phone cases that do double duty as your wallet. Are you looking for a product as versatile as you are? Are you a heavy digital device user looking for carry goods that are sophisticated enough to get you through the work day as well as the weekend? Are you tired of your friends making fun of you because you look like you're going to high school when you head out to work each day? We have a solution, and it's more attainable than you might think. Hey, I happen to be looking for a new shoulder bag just now and your bag looks great! Can you tell me what size your side pockets expand to, and whether they are made of slippery fabric? I have a Nalgene water bottle that's 3 1/4" across the bottom and I'm tired of fighting to get it into and out of the too-small pockets in my current bag. I also have a coffee mug that's just under 3" but that I also struggle with because it has a silicone sleeve that doesn't like the fabric of my current pockets. Thanks. @Michele The lining is a nylon fabric and is designed to allow things to slide in and out quite easily. The capacity of the side pockets depends on how full the bag is, as the sides are soft and can push inwards as well to allow for kore capacity. I can say that we have carried small Nalgene's in the side pockets often and a long as the bag isn't completely stuffed to its maximum volume, it works very well. While the pockets aren't wide, they are deep. A Nalgene should work just fine yet it would be a pretty snug fit. The fabric isn't slippery, but the same heavy textured material as the rest of the bag. A coffee mug might not be tall enough for the deep pockets, I'd be worried about it getting buried inside them. It looks great. I'm worried about how easily accessible the outer two packets are for thieves. I wish that top rolled down over the pockets. Otherwise it looks like a fabulous product. The front pockets were definitely designed for quick access and we wouldn't recommend storing anything valuable in there. that being said, there is a zipper pocket on the interior back wall made specifically for passports and other valuables, and the zippered laptop pocket on the side will also accommodate papers and other items along with a 15" laptop. I would like to see a backpack that has security locked pockets on the back so that no one behind us can get in and steal in crowded places when people touch your back and you don't feel if someone gets inside the pockets. We don't suggest holding anything valuable in those pockets as like anywhere, with any bag that you carry, there is risk of pick-pocketing. These side pockets would be great for things like water bottles that aren't as susceptible to thieves. Absolutely. For safety, we added an internal zip pocket that is great for stashing passports and other valuables in the main compartment where they're locked down away (from both thieves and the elements) by the roll-top closure. I'd love to see a version with mobile recharging pack/station, and cable management if you want to keep your devices in bag but still listen to media and respond to calls with headphones. It's a great idea. Thanks for the suggestions and we'll be sure to add it to our list! Up to what size laptop does it accommodate? The padded laptop compartment will fit most 15" computers easily without a sleeve. If you have an additional sleeve on your device that you plan to keep on it, I would recommend that the sizing is more of a 14" max. I would suggest at least altering it to fit the new 15.6" laptops with the wider keyboard. Those are usually the most common and/or cheapest laptops available today. I know a lot of high schoolers and college students that look or a backpack like this but own 15.6" laptops. Just consider it please. Thank you. It's a valid comment, and you'll be pleased to hear that our LB01 rolltop pack does indeed fit most 15.6" laptops. When we reference a"15" inch size, we are typically referring to 15.6" as you are correct, this is the most common size. As laptops are always changing year after year, we can't guarantee that all will fit, but fortunately the casings are getting thinner so the 15.6" laptop of today is typically slimmer than the 15.6" laptop from previous years. If you have a 15.6" laptop you should indeed be covered with the rolltop pack. Sorry for any confusion! Will this fit a 17" Macbook Pro (16" x 10.5" x 1") in the laptop compartment? Unfortunately it won't fit a 17" in the padded zipper compartment. Sorry about that. PKG (pronounced package) specializes in contemporary, personal gear for the digital age. 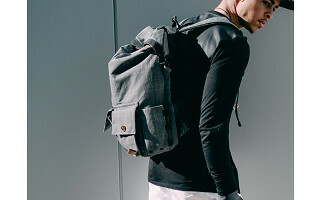 Their rolltop backpacks for device-toting urban warriors are designed with a clean, modern aesthetic and constructed with lightweight, high-tech materials that are breathable and waterproof. With thoughtful features like an external laptop compartment, closures with buckles, padded shoulder straps, and microfiber screen cleaning cloth, this versatile piece will be your go-to bag for all occasions. Based in Ontario Canada, PKG was founded by brothers Andy and Mike Priestman after their search for functional and handsome carriers. They were inspired by their own business-travel needs, which extended beyond traditional gym bags and briefcases to include storing and protecting their electronics.